San Ignacio is the most important archeological complex in this area, named a World Heritage Site by UNESCO. 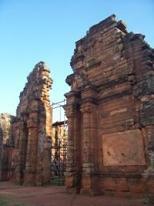 In addition to being very large and complex, the ruins are the best-preserved remains of any Jesuit town. The different buildings include a temple, workshops and educational buildings, family homes, and a large park. Among these buildiungs there is plenty of beautiful art created by the Guaraní Indians. In 1609 a group of Spanish Jesuit missionaries began to establish settlements in the Parana basin of Paraguay, Brazil and Brazil. They had made previous attempts to set up missions in the Chaco region, but failed, so they moved on to the Parana basin, where they gathered thousands of Guaraní Indians to join their settlements. Of the 30 missions that the Spanish Jesuits developed, 16 were in present day Brazil. Many of the missions burned down or were sacked and destroyed by the paulistas and bandeirantes, Brazilian slave traders who wanted to capture the Guaranies. When almost all of the missions were wiped out, the Jesuits moved the settlements, and the settlers, down the Parana River to reestablish the missions. One of the only missions that remain intact today in Brazil is the settlement at San Ignacio Mini, which was founded in 1632. The wild bird sanctuary is located on the Iguassu river and is surrounded by a subtropical rainforest with a richness of wild fauna and is located 25 miles from the spectacular Iguassu Waterfalls. The lodge has over 500 birds on display, both indigenous and from other continents and visitors can be in contact with the birds without the restriction of netting and cages. The Itaipu Dam is the world's largest hydro-electric project and stands only 6 miles up the Rio Parana from the Iguassu Falls. The grand long and curving structure is quite an interesting site. Typical tours take you to see the dam from the side and to see the view from the top of the dam. Informative videos are also shown to visitors. The Aripuca is a site of an agricultural colony and ecotourist destination located 8 miles from the Waterfalls of Iguassu. Aripuca is dedicated to create awareness and to begin actions to preserve and to promote the care of the environment.